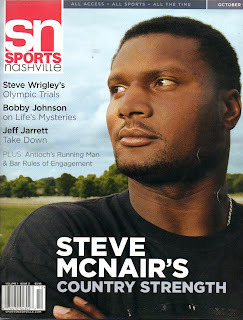 I spent an afternoon with Steve McNair in the summer of 2004 getting photos for Sports Nashville magazine. You could tell McNair had a lot on his mind that afternoon, but was receptive to the ideas that were being thrown out to him. My most vivid memory comes from when we had him down by a creek on the property where we were shooting. We kept moving around trying to get the right angle or right light, but McNair was perfectly content with the fishing pole we'd put in his hands to just cast a few times into this stream. It was the most relaxed we saw him all day. It now stands in stark contrast to the news of the day, a story that's probably only going to get uglier as the details emerge. Rest in peace, Steve. I'll always remember your strength on the field, and your smile beside that stream.